The Bonner County 4-H Shooting Sports Rifle and Pistol projects held their completion event on Sunday, August 8 at the Sandpoint Shooting Range. Members displayed their shooting ability as well as range safety and knowledge of the project. This year we had 15 members complete at this event. Participating in the rifle shoot were Alex Banks, Thomas Banks, Brandon Johnson, Tyler Wilson, Gabriel Theander, William Turner, Blaine Nelson, Josiah Widmayer, Mahonri Hunsaker, Erick Hicks, Tanner Wilson, Cameron Parks. Alex Banks, Thomas Banks also participated in the pistol shoot. Not picture is Austin Theander who participated in the pistol shoot. 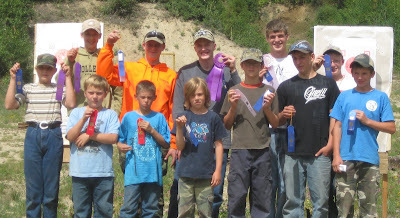 The Bonner County 4-H program would like to thank Rangemaster Cliff Lanning and the Sandpoint Shooting Range for their support and help in this event. Top awards for the Pistol Shoot went to Alex Banks, senior champion and overall champion, (Marrion Newsom Banks, volunteer leader and proud parent) Thomas Banks, intermediate champion and Austin Theander, senior and overall reserve champion. Participating in the rifle shoot were Alex Banks, Thomas Banks, Brandon Johnson, Tyler Wilson, Gabriel Theander, William Turner, Blaine Nelson, Josiah Widmayer, Mahonri Hunsaker, Erick Hicks, Tanner Wilson, Cameron Parks.